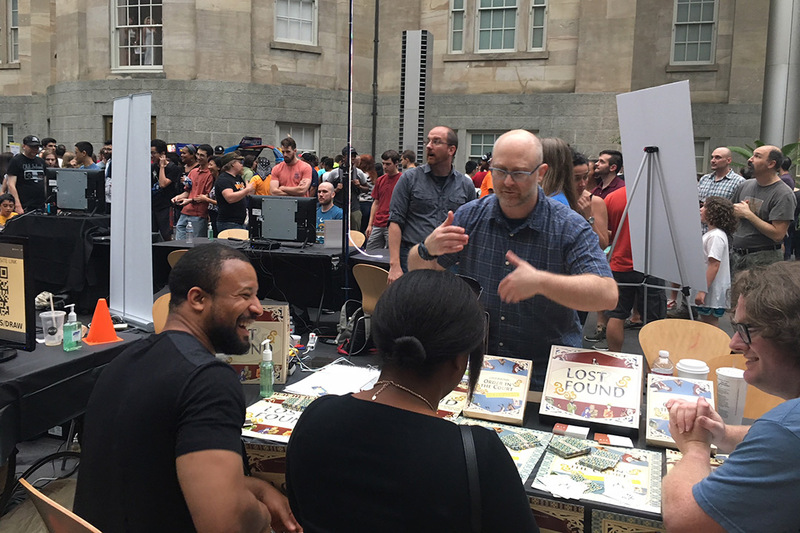 Owen Gottlieb, assistant professor of interactive games and media at RIT, demos the game Lost &amp; Found: Order in the Court - the Party Game at the Smithsonian SAAM Arcade in July. A team at RIT has been on the road to showcase their serious tabletop game Lost &amp; Found, which is receiving accolades for promoting and enhancing the public’s understanding of religion and law. The interdisciplinary team of Rochester Institute of Technology faculty and student researchers, designers and developers that created the Lost & Found tabletop game is getting recognition for its design. Throughout the year, the game has been featured at several showcases for independent and serious games, including at the Smithsonian and MIT. Owen Gottlieb, assistant professor of interactive games and media; Ian Schreiber, assistant professor of interactive games and media; and other members of the team are continuing to take the game on a roadshow to demonstrate the first two games in the series. According to Gottlieb, executive producer and lead researcher of the series, the game gives players and educators a unique perspective of 12th-century Cairo and teaches about medieval religious legal codes. The purpose of the game is to change the discourse about religious legal systems, enhance the public’s understanding of religion, improve discussion surrounding religious legal systems and increase awareness of the pro-social aspects of religious legal systems, including collaboration and cooperation. The game was added to a Strong National Museum of Play collection in spring 2018. The team won a Bronze Medal at the International Serious Play Awards and was invited to display the game at the Serious Play Conference events at George Mason University and University at Buffalo in July. Lost & Found was one of only 15 independent games selected for the SAAM Arcade showcase, presented by the Smithsonian American Art Museum July 22 in Washington, D.C. The game was featured at the Connected Learning Summit Aug. 1-3 at the MIT Media Lab. The team showcased the game at the Boston Festival of Independent Games (FIG) Fest, on Sept. 29. Lost & Found won best non-digital game at the International Academic Conference on Meaningful Play Oct. 11-13 in East Lansing, Mich.
Gottlieb presented the game at the North American Simulation and Gaming Association (NASAGA) Conference, held Oct. 16-19 in Rochester, N.Y. In the first game of the series, Lost & Found, players take on the role of villagers who must balance personal needs with the needs of the community, all while navigating medieval religious sacred law systems. The game centers on laws that help solve community problems and were handed down over hundreds and sometimes thousands of years of legal tradition. The initial model of the game teaches Moses Maimonides’ Mishneh Torah, a medieval Jewish law code. The team is currently designing an Islamic law expansion module for the game. The second game in the series, Lost & Found: Order in the Court, is a party game in which players compete to win the judge’s favor by constructing the best story to explain how a seemingly arcane medieval law might have gotten to court in the first place. While the first game deals with trade off decisions players must make between family and community, the second game centers on legal reasoning. The game was created by faculty in RIT’s School of Interactive Games and Media and Graphic Design—including Gottlieb, Schreiber and David Simkins, associate professor. Faculty members from Harvard Divinity School, Vanderbilt University, Ithaca College, CoExist and Nazareth College also contributed to the team. Twenty undergraduate and thirteen graduate students at RIT—in the disciplines of research-based game design, illustration, graphic design, project management and knowledge management—have also worked on the games along with faculty since 2014, to bring the games to life. Lost & Found is available for $38.99 and is geared toward high school and college-aged students due to its level of strategic complexity. Lost & Found: Order in the Court – the Party Game, is available for $35.99 and is accessible for junior high students as well as older teens and adults. Both games are available at lostandfoundthegame.com, Shop One2 at RIT’s Global Village and the Strong Museum Gift Shop. The games are distributed through RIT’s MAGIC Spell Studios. The project was developed through the Initiative in Religion, Culture and Policy @MAGIC, housed within RIT’s Center for Media, Arts, Games, Interaction and Creativity (MAGIC). Gottlieb is the founder and lead research faculty of the initiative, which cultivates new research focused on games, religious literacy, the acquisition of cultural practices and the implications on policy and politics. Also credited in the production of both games are the B. Thomas Golisano College of Computing and Information Sciences and RIT’s Office of the Vice President for Research. The digital prototype version of Lost & Found was supported and funded by the National Endowment for the Humanities. That prototype was featured at the Digital Humanities Arcade of the 50th Anniversary of the NEH at the University of Virginia in 2016.